Projection strobing (CC) Paulo Barcelos. This is generally the time of year to look back at 2009. 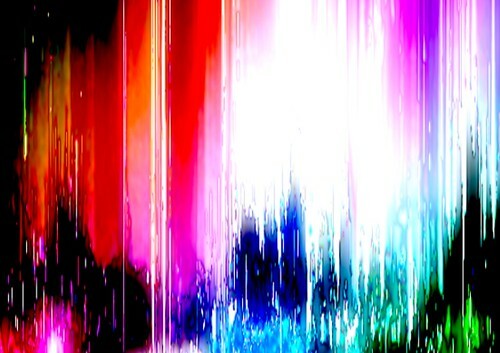 But in the world of visualists, even more than other media, it’s what’s ahead that looks brightest. When I asked earlier this week for the best visualist work of the year, I noticed something. People immediately began talking about tools rather than people. I’m still interested in beginning to survey some of the best artists out there in a variety of media, from club visuals to interactive art to gaming – indeed, the silence on this issue, compared to hundreds of comments about music albums on our sister site, speaks volumes to the need in the community for more. But maybe there’s something to be said for looking at tools. Tools represent possibility, the projects to come, and the blank canvas. And while I believe artists should endeavor to use the tools at hand, a number of developments in 2009 suggest where we may spend our time in 2010. Here are a few of those milestones, as suggested by you (and me). A very, very Happy New Year. CDMusic celebrated its fifth at the end of 2009; CDMotion has new potential in early 2010, too. 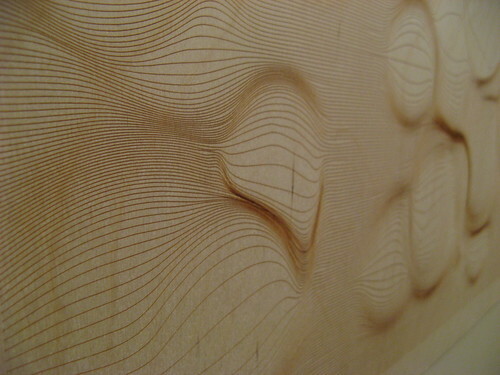 Marius Watz’s Processing-generated, laser-cut wood engravings, from Brooklyn’s systemsystem show in October. 1. Processing is on all cylinders. After reaching the end of its beta in late 2008, Processing 1.0 got extra polish in 2009. 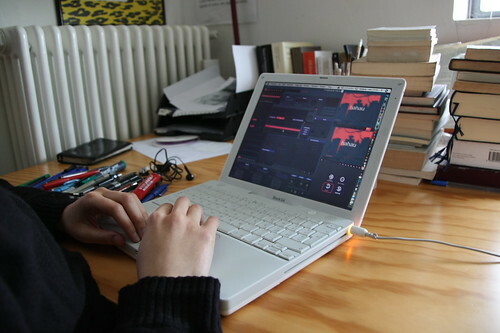 But two libraries by Andrés Colubri promise to really make Processing the must-have visualist programming tool. GSVideo, based on the high-performance, open-source, omni-platform GStreamer back-end, and GLGraphics, a fully GPU-accelerated OpenGL library, point to the future of Processing’s graphics pipeline. Heavy development this year ensured easier installation on multiple OSes, and these libraries keep getting better. They also aggressively disprove the “you can’t do that with Java” theory, by delivering blazing performance. 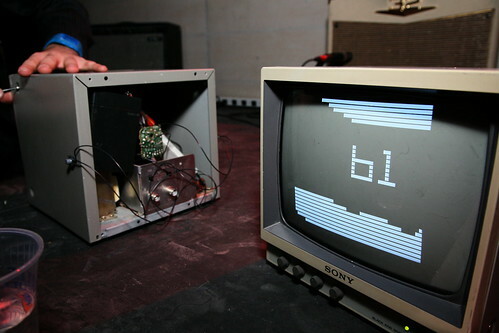 Quartz Composer slit scan video (CC) EB Morse. 3. Kineme makes Quartz Composer livable. For Mac heads and fans of graphical patching, Quartz Composer is a promising tool that can also be … well, annoying unfinished. But leave it to some hackers to make it workable. Kineme is a community, a set of patches and plug-ins, tools, documentation … it’s a way to make Quartz Composer feel like home. NOT an image of Unreal Engine. Kill Jet at Kokoromi’s Gamma 256, (CC) Simon Law. 4. Gaming and visualism are coming together. Game engines no longer break the bank. Unity and Unreal Engine are free. Powerful open source tools continue to mature. Microsoft’s XNA (cost: around $100) makes even coding for Xbox 360 a reasonable proposition, both in ease and expense. But of course, bleeding-edge gaming technology aside, perhaps what really matters is that gaming tech of all kinds is merging with visualist practice – see above. 5. Blender 2.5 is coming. Open source, a compromise? How about one of the most sophisticated 3D modeling tools, compositing tools, video editing tools, animation tools, game engine tools … all in one? That’s long been the proposition of Blender. The trade-off: it’s been a punishing tool to try to use. 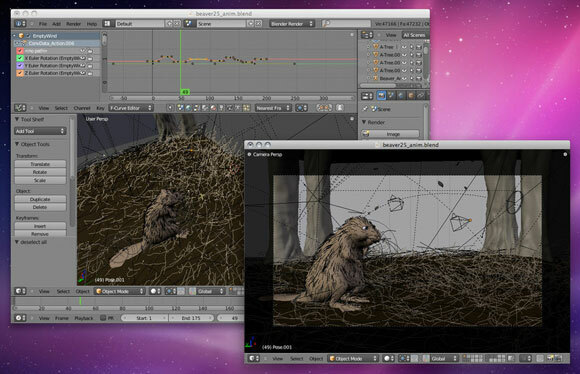 With a fleshed-out feature set and entirely new UI, Blender 2.5 promises to change all that. And the first proof that we’ll see it in finished form came late this year, as 2.5 hit alpha. 2.49 is already solid, but 2.5 is something previous releases – and many commercial rivals – weren’t: fun. 6. 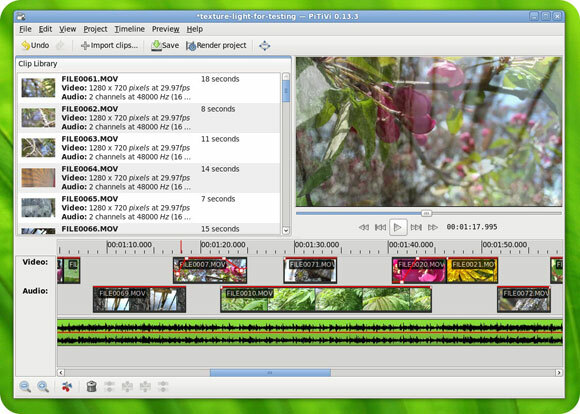 Open source video editing could save us time and pain. Especially with all these other, powerful tools, it’s time for video editing to be a more seamless part of our world. That means both free tools that reduce pain dealing with codecs and editing for end users, and the kinds of tools that developers can pick up and incorporate in their own creative projects. (Imagine video editing applications as re-imagined by visualists, rather than only what works as a commercial product fro someone who’s just bought a new camcorder.) Projects like PiTiVi have begun to do just that. By the end of ’09, PiTiVi is a usable application for basic slicing and dicing, and I’ve had Linux apps manage to edit video my pricey commercial apps can’t – no time-consuming rendering required. But it’s what these projects offer developers that may be most compelling. PiTiVi, for instance, offers a modern framework of modules which a Python coder can incorporate into their own ideas. Modul8ing carries on. Photo (CC) Ambra Galassi. Control, yesterday and today. Photo (CC) Joshua Schnable. 8. While the music industry was worrying and having meetings, visualists made OSC happen. I’ve heard an endless string of objections to why OpenSoundControl – a stunningly simple, modern framework for communication and control based largely on existing Internet standards – isn’t practical. There’s no hardware. Users aren’t used to it. It’s too hard to implement. It’s not well-documented. There’s a chicken-and-egg problem. We have other priorities. And so it is that major music manufacturers with hundreds (or thousands) of employees seem unable to do anything about the fact that MIDI is an antiquated serial standard based on long-defunct assumptions about how hardware has to work. Apparently, visual developers didn’t get the memo. One- and two-person teams, in many cases, managed to bang out OSC support. 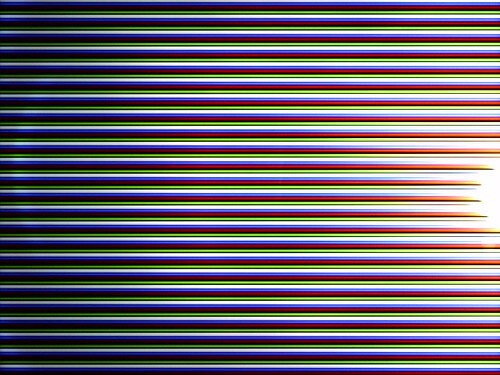 It’s now a standard you can expect in any modern “VJ” app. The result: anyone with a device like an iPhone or iPod touch (tens of millions of units alone), and soon other gear, too (Android, anyone? ), can easily control apps. OSC learn works more easily than MIDI learn, and people who’ve only just begun programming as students are writing OSC code. It’s a grand achievement for visualist software – and it should be an embarrassment to the music tech industry. 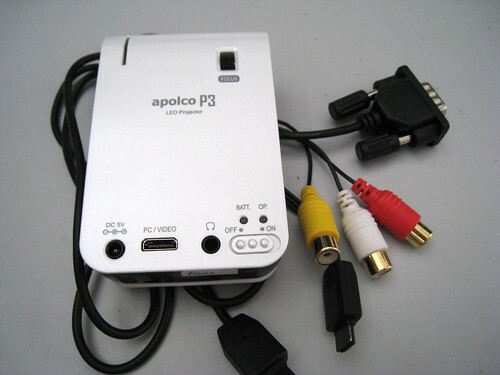 Micro projector for your pocket, (CC) Cheon Fong Liew. 10. There’s a new community around projection mapping. I don’t think I even need to say much about this. The phrase “projection mapping” is meaningless to nearly everyone, but no matter: around the world, artists working on mapping projections to objects and outdoor architecture are finally connecting with one another, sharing techniques, and sharing tools. If there was one theme to CDMotion this year, this was it. And it’s important, because it finally helps the art of live visuals escape to more surfaces and contexts. VLMC, Open Source Video Editing from VLC Creators – QuickTime Pro Replacement?